Demonstrating economic benefits generated by protected areas is often pointed out as pivotal for supporting decision-making. We argue in this paper that the concept of ecosystem services (ES), defined as the benefits humans derive from ecosystems, provides a consistent framework to approach this issue as it links ecosystem functioning and benefits, including benefits with economic value. This study aimed at providing evidence on how to bring the economic value of protected areas to the decision-making process and contributing to extend current EU Member States' experience in mapping and assessing the economic value of ES in the context of the EU Biodiversity Strategy to 2020 (Action 5). In doing so, we used the Natural Park of Serra de S. Mamede (PNSSM), located in the Alentejo NUTS II region, as a case study. We followed a three-step approach to pursue our goals, entailing stakeholders' engagement for selecting relevant ES (through a participatory workshop), biophysical mapping of ES flows (based on a multi-tiered approach depending on data availability) and spatial economic estimation of such flows (using value transfer, willingness-to-pay and market price methods). Our results indicate that the ES with highest economic value are not always the ones with higher perceived value by stakeholders. For most ES, the economic value increased with increasing protection level within the park, except for the crop production service. Although no formal uncertainty or sensitivity analysis has been performed, the following range is based on a critical assessment of non-primary data used. We estimated the aggregate annual value of PNSSM to be 11 to 33M€/year (representing 0.1 to 0.3% of the regional NUTSII Alentejo Gross Domestic Product). Our findings reinforce the need to adopt mixes of monetary and non-monetary valuation processes and not to rely just on one approach or measure of value while bringing ES into protected areas management. Protected areas (PA) remain a cornerstone of global conservation efforts ( Lopoukhine et al. 2012 ). Here we argue that their effective management calls for the integration of ecosystem services. Our arguments are driven by the increasing understanding of the concept of ecosystem services, the growing number of studies suggesting the link between biodiversity and the supply of ecosystem services (e.g. Ingram et al. 2012, Cordingley et al. 2015, Seppelt et al. 2016 ) and the concomitant emerging adoption of the concept by European decision-making bodies ( Bouwma et al. 2018 ), including at the strategic level as illustrated by the 2020 EU Biodiversity Strategy ( European Commission 2011 ). The establishment of PA worldwide has been marked by different paradigms ranging from the original “wilderness” paradigm (strict protection) to other new models that clearly recognise the role of locals and of the maintenance of their practices as fundamental to preserve the inherent features of the area (e.g. biodiversity or landscapes) or, in different words, to preserve the benefits that society derives and desires to protect from spoiling or injury. Notwithstanding the evolutionary trend observed, different models have co-existed, at least in Europe and particularly in Portugal ( Pinto and Partidário 2012 ) and no single model fits a best approach to the establishment of a PA. For instance, while some defend the importance of cultural landscapes (usually less intensive, human dominated and multifunctional and which often represent habitats for several threatened species that have become adapted to those areas due to their original habitat degradation), there are also arguments in favour of re-wilding as an approach that would favour certain species recovery ( Cerqueira et al. 2015, Pereira and Navarro 2015 ). Although discussing the philosophy and views on protected areas establishment is out of our scope, it helps to frame the potential role of economic valuation of ecosystem services (here broadly defined as the benefits humans derive from ecological functioning, whether natural or human dominated), as it reveals that decision-making, in such regard, is not always a straightforward process, featuring a resource allocation problem often marked by conflicts amongst stakeholders and different opportunity costs. In a nutshell, defining the establishment of a PA implies the selection of geographical boundaries given protection goals, which levels of protection are adequate, should they be different within the protected area, which resources are needed and how to optimally allocate them. Despite the multiple challenges involved in conservation efforts, in this paper we address the use of economic valuation of ecosystem services as a tool to ensure that economic benefits provided by protected areas are properly considered in decision-making and in such a way that ecological heterogeneity could be captured ( Troy and Wilson 2006, Paletto et al. 2015 ), therefore bringing the spatial dimension of economic value into the particular case of protected area management. The work presented hereafter is part of a larger mapping and assessment of ecosystems and their services carried out in Portugal ( Marta-Pedroso et al. 2014 ), as foreseen in action 5 (“Member States, with the assistance of the Commission, will map and assess the state of ecosystems and their services in their national territory by 2014, assess the economic value of such services, and promote the integration of these values into accounting and reporting systems at EU and national level by 2020”) of Target 2 of the EU Biodiversity Strategy (“By 2020, ecosystems and their services are maintained and enhanced by establishing green infrastructure and restoring at least 15% of degraded ecosystems”). 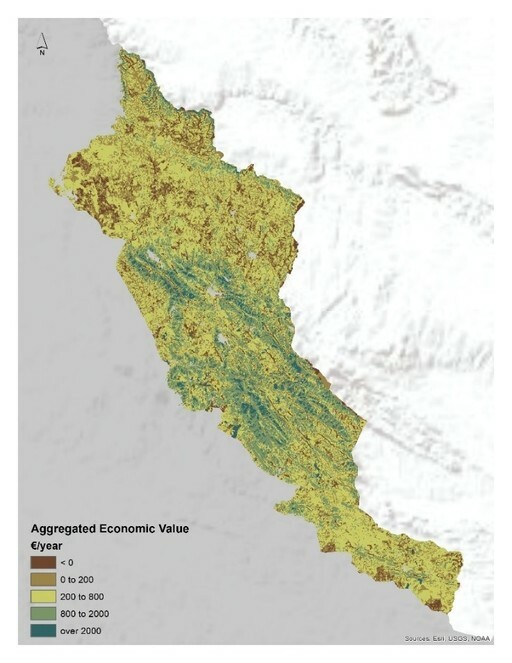 Given this context and considering the arguments in favour of the use of economic valuation as a tool to ensure that economic benefits provided by protected areas are properly considered in decision-making, as well as the challenges it poses, the aim of the present study is two-fold: to contribute to enhance current EU Member States' experience in mapping and assessing economic value of ecosystem services in the context of the EU Biodiversity Strategy to 2020 (Action 5) and to present a non-primary data-based methodology to bring the economic value of Protected Area to the decision-making process. To pursue this goal, we have selected the Natural Park of Serra de São Mamede (PNSSM) as a case study. The Natural Park of Serra de São Mamede (PNSSM), located in the inner-central part of Portugal, within the Alentejo NUTS II region, was created by the Decree-law 121/89 of 14th which has been since amended by the Decree-law No. 20/2004. This decree, which is currently in force, reclassified the PNSSM by defining its new limits, specific objectives for protection, managing and monitoring procedures, management authorities and restriction settings (i.e. forbidden activities and the permissible hunting activities). Regarding the park’s new limits, the need for amendment has arisen from the assessment taken under the scope of Natura 2000 establishment and also from studies carried out envisioning the development of land use conditionings for the park. Indeed, both assessments revealed contiguous areas to the former park limits of high natural values, which motivated the park's enlargement. Also underlying the park reclassification was the need to refrain from land-use changes that were threatening the unique character of the landscape occurring within the park, whose preservation depends on human presence and in the maintenance of traditional land uses. In its current definition, the PNSSM covers an area of 56021ha, embracing the Municipalities of Arronches, Castelo de Vide, Marvão and Portalegre and being limited to the East by Badajoz province (Extremadura, Spain) - Fig. 1 . The land use/cover (LUC) within the park, based on the most recent available land use/cover national cartography (COS 2007) is dominated by forests, open forests and shrubland, which represents, respectively, 22% and 38% of the park’s area ( Fig. 1 ). Location and Land use/cover (LULC) of PNSSM following national cartography (COS 2007 level 2). The PNSSM includes the mountain ridge called “Serra de São Mamede”, which is the only range south of the River Tagus with climatic conditions that allow the presence of Atlantic plants and therefore contributes to the variety of remarkable habitat and plant diversity within the PNSSM. Indeed, the PNSSM is completely confined within the São Mamede Natura 2000 Site of Community Interest (SIC) - PTCON0007, established by the Council Ministers’ Decision No. 142/97 of 28 August, representing around 45% of the site’s area ( Fig. 1 ). Within the park, there is a carbonated aquifer with 8 km2 which can offer annual water supplies of 7.7*106 m3/year. Until recently, this was the main urban water supplier to the municipalities of Castelo de Vide, Marvão e Portalegre and also the main source of water for agriculture in the region. Additionally, within PNSSM, there is an industrial mineral water collecting and bottling facility with high relevance to the local economy. Indeed, water resources have always been an important resource to the region with some arguing that the abundance of water springs was responsible for the Romans settling in the region ( Vermeulen et al. 2010 ). Areas of complementary protection (Type II) - remaining areas of less value for nature conservation, which correspond to areas of more intensive land use where it is intended to reconcile human intervention and local social and economic development with natural and landscape values and objectives of nature conservation. Different initiatives, amongst which MA (Millennium Ecosystem Assessment) and the TEEB (The Economics of Ecosystems and Biodiversity), have increased awareness of the importance of biodiversity and ecosystems in contributing to human well-being and hence have called for their inclusion in policy-making but also into business and individual spheres. Recently and leveraging the above-mentioned initiatives, the MAES initiative (Mapping and Assessment of Ecosystem Services in Europe) brings the need to account for the linkages amongst biodiversity, ecosystems services and wellbeing as a fundamental pillar of the EU Biodiversity Strategy to 2020. From a methodological point of view, the work presented here adopted an ecosystem services framework, aligned with the above-mentioned initiatives (“cascade model" based, Potschin and Haines-Young 2011 ). Although we recognise the plurality of values of ecosystem services ( Arias-Arévalo et al. 2018 ), the particular focus of this paper is on generating economic values and bringing their spatial dimensions into nature conservation planning under a hierarchical analytical framework described in the next section. The hierarchical analytical framework applied in this study, which combines participatory, biophysical assessment and economic value estimation and mapping methods, comprised three stages: a) inventory of relevant ecosystem services (ES) delivered by the PNSSM based on local stakeholders perception evaluation; b) investigation of which of the ES selected by local stakeholders were liable to be biophysically mapped and valued with information readily available; and c) estimation and mapping of the economic value of ES. This framework presents an induced selection of ES, in the sense that it may be the case that only some of the ES identified as relevant by stakeholders are considered for economic valuation (and mapping) ( Fig. 3 ). Information availability and its readiness for the purpose of mapping economic values of ES delivered by the PNSSMand perceived by local stakeholders, were the major determinant of the final suite of ES for which we have estimated and mapped the economic value. Induced selection of ecosystem services (ES) considered in this study. Stakeholders’ involvement in PA (Protected Areas) management is of the utmost importance as success of conservation and management measures relies on their acceptance by local stakeholders ( Niedziałkowski et al. 2018, Sterling et al. 2017 ). This is particularly important for the present case as most of the area within the PNSSM is privately-owned. The use of maps and spatial-based valuation methods of ES in the context of natural resources management and PA management, is supported by the spatial nature of ES, e.g. their heterogeneity in space ( Marta-Pedroso et al. 2014a, Maes et al. 2016 ) and by their advantages as visualisation and communication tools into decision-making processes ( Potschin et al. 2016 ). Our definition of (local) stakeholders is aligned with the one proposed by Sterling et al. 2017 and therefore it refers to individuals or groups who directly rely on or impact the specific targets of resource management or conservation action (e.g. indigenous landholders, farmers, fishers, local non-governmental organisations or local researchers). Stakeholders identification started with a brainstorming session between the research team and local contacts about whom to specifically invite or consult with and how to engage those individuals or groups. 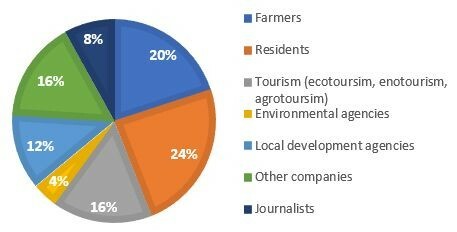 As described above (Case Study) and despite restrictions in terms of land use, maintenance of human presence and traditional economic activities are of the utmost importance for the maintenance and long term preservation of the high natural and landscape values of the PNSSM and, hence, coverage of sectoral activities taking place within the PNSSM was a major criterion in selecting stakeholders. Despite this group of primary stakeholders, local media, locals NGO (Non-Governmental Agencies) and opinion leaders (e.g. former politicians) were also engaged. In addition to specific interests, impacts or dependencies on the PNSSM, diversity of age, gender and education also guided the selection made. Based on the stakeholder analysis performed, representatives of local stakeholders were invited to participate in a one-day participative workshop. Invitations were sent via e-mail and later confirmed by telephone. The workshop aimed at capturing stakeholders’ perception on the values of PNSSM. Although there are different approaches to capture stakeholders' perceptions of value ( Mascarenhas et al. 2016 ), we opted for an invited participative workshop as it allowed gathering different visions and perceptions on the PNSSM and their services in a short time ( Younge and Fowkes 2003 ). The workshop was structured in different activities for different purposes, but overall the aim was that stakeholders could (i) identify all ecosystem services (ES) provided by the park ( Fig. 4a ) and (ii) prioritise these ES based on a points-system ( Fig. 4b ). For the first activity, participants were randomly divided into six groups and each group was asked to focus on a particular ES section (provisioning, regulating and cultural services - 2 groups per section). All of the ES listed by participants were written down in this phase, with no screening or restriction whatsoever. Next, the groups of each section were joined together to discuss the ES listed and provide a final consensus list of ecosystem services. 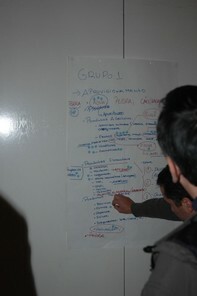 The final lists, one per ecosystem service section, were then pinned to the wall and used in the subsequent activities. For the second activity, each participant was given 3 points/votes per ES section (provisioning, regulating and cultural) to attribute to the services they considered most relevant. The points could be attributed as preferred (i.e. three points to the same ES or one point to three different ES of a given section). All participants used all of their points/votes. To avoid biasing the perception of participants regarding the ecosystem services (ES) delivered by the park, we have refrained from providing them with a pre-classification list of ES. Instead, we simply explained the concept of ES and allowed participants to freely list what they considered to be benefits people derive from the park’s natural areas, providing assistance whenever required and steering the discussion as little as possible to ensure participants indeed understood what ES were. In this regard, translating the ecosystem services, listed by stakeholders to a common classification (i.e. CICES) in a post-workshop phase, provided a good basis for standardisation of our results while guaranteeing stakeholder’s perspectives were unbiased and fully comprehensible in our methodology. Additionally, by using a two-step method to help stakeholders identify the ES delivered by the park (i.e. first a round-table discussion per group followed by a consensus discussion involving more than one group), we aimed at avoiding biases that could arise from opinion monopolisation ( Palomo et al. 2011 ). Once local stakeholders’ perceptions and relevant ES listing were known, we narrowed down the set of relevant ES to which biophysical and economic dimension could be spatially quantified, based on data availability and readiness of its use for our purpose. Based on this screening, a final set of six ES was included in this study: Crop production (CP), Extensive Animal production (AP), Fibre production (FP), Carbon sequestration (CS), Erosion regulation (ER) and Biodiversity, in terms of its cultural heritage (Biodiversity heritage - BH). In the next section, we explain how the mapping and valuation exercises were carried out. Economic methods for mapping and assessing ecosystem services principally involve measuring and accounting for the spatial variation in the economic value of ecosystem services and structuring this information to support decision-making and the design of policy instruments. If we refer to the cascade model ( Potschin and Haines-Young 2011 ), economic methods operate on the right side of the ecosystem services cascade model to quantify the benefits to humans. Any economic mapping or assessment therefore fundamentally relies on biophysical data and methods to quantify the capacity of ecosystems to supply ecosystem services (i.e. the left side of the cascade model) ( Maes and Burkhard 2017 ). Biophysical mapping was mainly based on land-use/land-cover (LULC), which was obtained with the most recent available national land cover cartography (COS 2007), at its lowest hierarchical level (level 5), hereafter referred to as COSN5. The Common International Classification of Ecosystem Services (CICES) was originally developed by Haines-Young and Potschin 2010 as part of the work on the revision of the System of Environmental and Economic Accounting (SEEA) led by the United Nations Statistical Division (UNSD). Since its release, CICES has been widely used in ecosystem services research for identifying and communicating specific services and, thus, for structuring ES mapping, assessment and valuation studies ( Czúcz et al. 2018 ). CICES differs from other existing classification systems especially in making the distinction between services and benefits clearer. The fact that CICES is conceptually based on the cascade model contributes to such feature and supports our decision in adopting the CICES (v5.1) in this study. The methods applied for quantifying and mapping each ecosystem service biophysical flow are summarised in Table 1 and their choice is based on Marta-Pedroso et al. 2014b . Data collection and processing was guided by availability and readiness of its use for our purpose. Mapping options comprised tier one approaches (biodiversity), tier 2 approaches (statistics-based) to more complex ones such as model-based (e.g. soil erosion avoidance and carbon sequestration). Adoption of tiered approaches for mapping have been largely advocated as it provide consistent but flexible ecosystem services mapping ( Grêt-Regamey et al. 2015, Maes et al. 2016 ). Final selection of ES (classification following CICES and specifications for this study) and brief description of biophysical mapping methods used. Crop production was mapped based on total annual production of main cultures present within the study area. Information obtained per municipality, based on official national agriculture statistics (Instituto Nacional de Estatística, INE). Spatialisation of this information was possible based on harmonisation of culture classes with LULC classes. 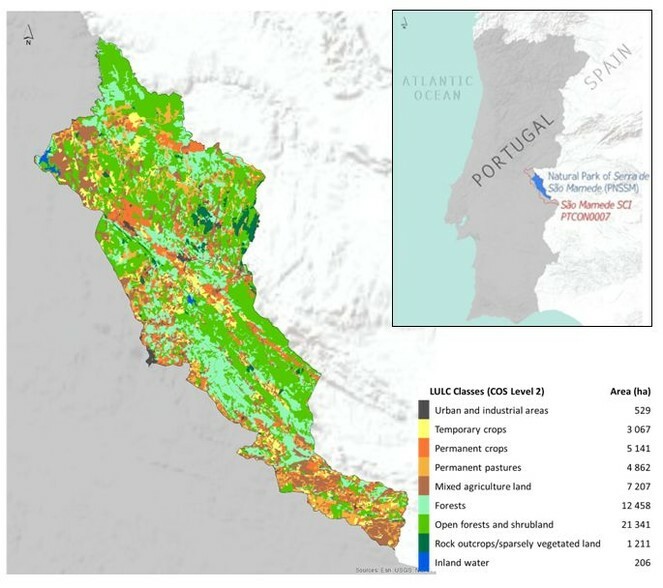 Fibre production mapping was based on yearly biomass increments per species, as reported in the Portuguese National Greenhouse Gases Inventory Report (NIR), according to its land use typology (Kyoto Protocol Classes, hereon KP. Classes of species considered were: Pinus pinaster, Pinus pinea, Quercus spp, Quercus suber, Quercus rotundifolia, Eucalyptus spp, mixed broadleaves forests and mixed coniferous forests. Average biomass losses due to natural mortality were discounted. Spatialisation of this information was possible based on harmonisation of KP classes legend with LULC classes from national cartography. Carbon Sequestration mapping was based on input/output balances in biomass (above and below ground). Annual emission and retention coefficients for each land-use were estimated based on the National Inventory Report results (NIR). We also considered land-use changes observed in a 17-year period. Spatialisation of this information was possible based on harmonisation of KP classes legend with LULC classes from national cartography. Biodiversity (as heritage) was mapped, based on presence (area) of protected habitats listed under the Annex I of the Council Directive 92/43/EEC. Since the 1960s, economists have developed a variety of methods for quantifying the economic value of ES, namely regarding those not priced and traded in markets to span the range of valuation challenges raised by the application of economic analyses to the complexity of the natural environment ( Brander 2013 ). An important distinction exists between methods that produce new or original information generally using primary data (primary valuation methods) and those that use existing information in new policy contexts (value transfer methods). The ES considered in the analysis and the economic valuation methods used are in Table 2 . ES were valued based on their annual flow or utilisation in common monetary units, €/year, inflation-adjusted to 2014 euros. In particular, the provisioning services were evaluated using market valuation (price-based), heritage value of biodiversity, based on inferred willingness-to-pay (WTP) (although primary data to estimate WTP have not been collected, the approach used falls into the revealed preference economic valuation methods). Method selection was, at first, guided by the type of information available and by the cost efficiency of method application. Below we describe each of the three approaches applied. For a comprehensive description of economic valuation foundation and methods, we direct the reader to publications devoted to depict and/or review the entire suite of economic valuation methods (see e.g. TEEB 2010, Bateman et al. 2011, Marta-Pedroso et al. 2014a, Koetse et al. 2015 ). Standard Gross margin (SGM) of each crop. SGM for each land use class was estimated as SGMLUC j = ΣAiSGMi/ΣAi, where Ai represents the area of cropi in the land use class (LUC)j. SGMi and Ai were obtained from official statistics. Standard Gross margin (SGM) of pastures typologies. An average LU (livestock unit) for each different type of pasture was considered. ANPV (Annualised Net Present Value) of timber given the Investment Return Analysis for the species of interest provided by Machado and Louro (2009) . For mixed LULC classes (i.e. when more than one forest species was present), the value was weighted according to an estimated cover percentage per species. Unit Value: 79.5€/ton based on the social cost of carbon estimations by Stern (2006) . Amount of carbon sequestered/emitted estimated in each pixel was multiplied by the unit value. Unit value: 4.75 €. ton-1.yr-1, based on replacement cost estimations by Marta-Pedroso et al. (2007) , The avoided erosion value estimated in each pixel was multiplied by the unit value. Compensatory payments given to farmers to carry out actions aimed at preserving the habitats listed under Annex I of the Council Directive 92/43/EEC. As compensatory amounts varied per habitat considered and per municipality location, spatialisation was possible by means of protected habitats’ cartography provided by PNSSM management. Price-based market valuation approaches rely on the use of prevailing prices for goods and services traded in markets while value transfer uses economic information captured at one place and time to make inferences about the economic value of environmental goods and services at another place and time. Value transfer comprised different approaches, varying in level of detail and information adjustments made and hence accuracy of estimates obtained. In our case, the unit value transfer was applied. In practice, unit value transfer uses values for ecosystem services obtained in a different location and/or context, expressed as a value per unit (e.g. per area), combined with information on the quantity of ecosystem service units delivered at the study area (in our case, PNSSM). Although unit values can be adjusted to reflect differences between the study and policy sites (e.g. income and price levels), we did not adjust the transferred values. In the case of biodiversity, heritage value estimation was based on farmers’ compensatory payments for the ITI of Serra de São Mamede ( MADRP 2010 ). 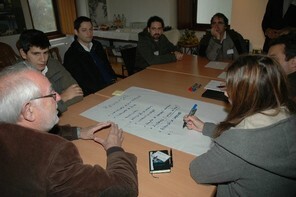 The ITIs were the main instrument within ProDeR (Rural Development Programme for Portugal Mainland 2007-2013) for action in Natura 2000 areas, consisting of a combined approach of various policy instruments consistently applied in a territory within an over-arching objective, the conservation of natural values. From the set of eligible interventions within the ITI of Serra de São Mamede, we considered the minimum and the maximum expected value (€.ha-1.year-1) that would be given to farmers as compensatory payments if action to preserve the habitats are taken. In a certain way, this range can be seen as societal WTP to preserve the biodiversity heritage as we assume that public support is defined by governments as representative of society preferences. In this section, we present the results of each of the stages entailed in our methodology, as described in the previous section. A total of 25 stakeholders representing different interests, dependencies and impacts on the park attended the workshop ( Fig. 5 ). Profile of local stakeholders participating in the workshop. (Residents refer to those living within the park but whose professional activity is not directly dependent on the park). In Table 3 , we summarise the ES identified as relevant by local stakeholders through the participative workshop, following their reclassification using the CICES (v5.1) system. It turns out that, amongst the ES perceived by participants as being delivered by the PNSSM, a total of seventeen ES were listed as relevant (i.e. received at least one point). Considering the points attributed, cultural and provisioning services were the most valued, receiving a total of 41% and 31% of the points, respectively. 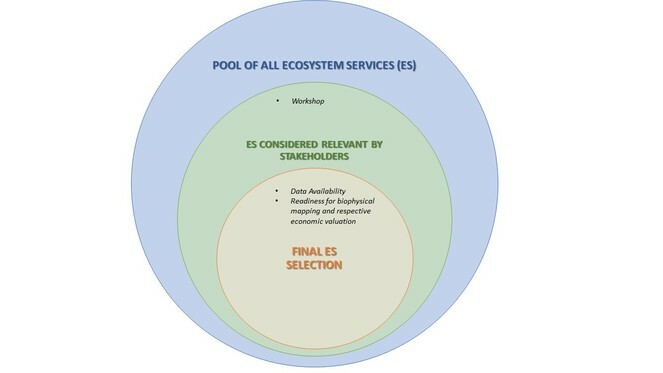 Ecosystem Services identified as relevant by stakeholders, correspondence with CICES classification and prioritisation of ES by stakeholders through the points- system. Following the analytical framework adopted, once data availability and readiness of use for our purpose were evaluated, our mapping and economic valuation of ES was restricted to six out of the seventeen ES identified as relevant by local stakeholders. As explained in the methodological section, it is not feasible to map economic values without mapping the biophysical dimension of ES (annual flow in our case). Based on this fact and to reinforce such constraint but also to highlight that maps of different dimension of ES can provide different insights for PA management, we present both the biophysical and economic value ( Figs 6, 7, 8, 9, 10, 11 ) for each one of the six ES. The reader should bear in mind that to produce economic value maps, economic valuation methods were applied ( Table 2 ). The designation of each ecosystem service was simplified for practical purposes, but we provide the CICES code in square brackets for comparison with the services listed above in Table 3 . 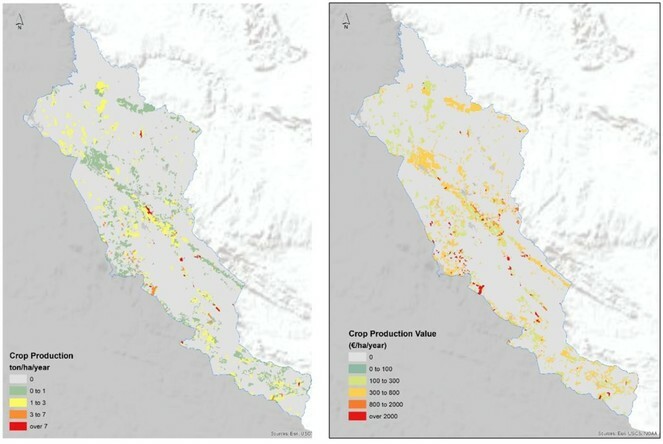 Spatial quantification (left) and economic valuation (right) of Crop Production service [1.1.1.1] within PNSSM. 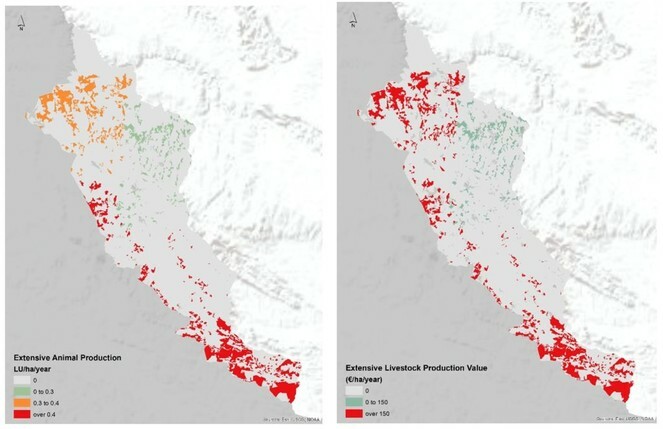 Spatial quantification (left) and economic valuation (right) of Extensive Animal Production service [1.1.3.1] within PNSSM. 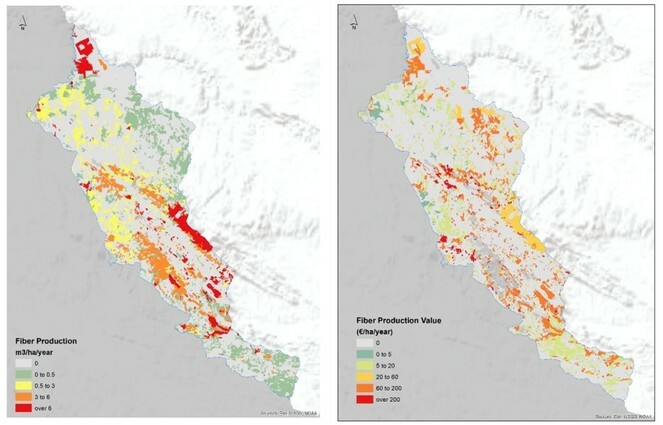 Spatial quantification (left) and economic valuation (right) of Fibre Production service [1.1.1.2] within PNSSM. 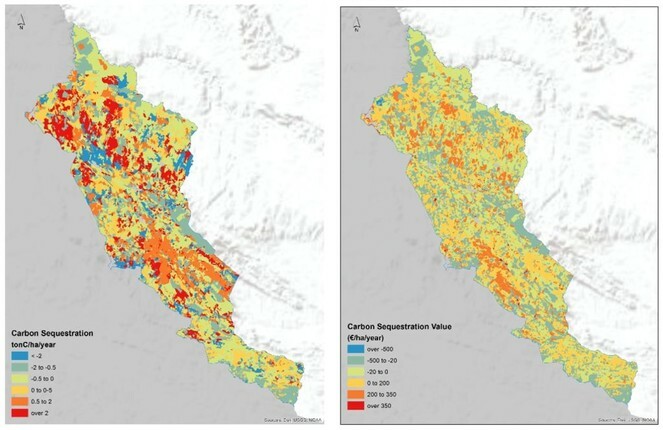 Spatial quantification (left) and economic valuation (right) of Carbon Sequestration service [2.3.5.1] within PNSSM. 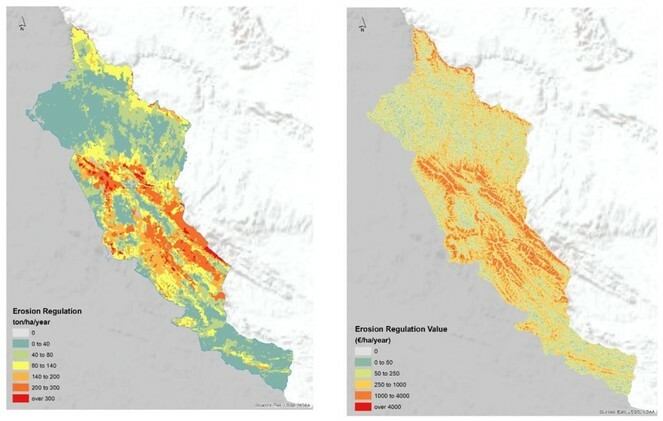 Spatial quantification (left) and economic valuation (right) of Erosion Regulation service [2.2.1.1] within PNSSM. 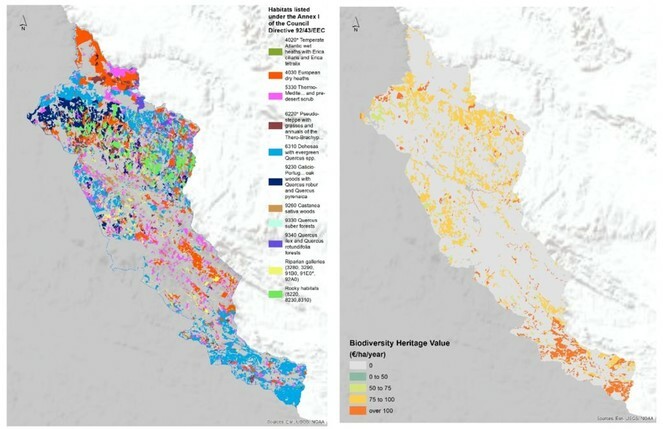 Spatial quantification (left) and economic valuation (right) of Biodiversity (as heritage) [3.1.2.3] within PNSSM. Before addressing value figures, we would like to stress that our purpose is to provide methodological guidance to integrate ES into PA management rather than absolute value figures for the PNSSM. Moreover, the aggregated estimation of economic value presented in this section does not include all the ES listed by local stakeholders as relevant (e.g. water availability and quality are not included in our estimation). Additionally, as mentioned earlier in this paper, our estimations are based on non-primary data and therefore we are aware of possible bias introduced by that fact. For instance, we consider the economic value of erosion regulation as deserving more caution in reading and interpreting the results we present here, as we further elaborate later in our discussion. By multiplying the annual economic value estimated for each ES (€.ha-1) by the area of each pixel where it occurs and summing the results, we obtained an aggregated value map for the park ( Fig. 12 ). Despite the considerations mentioned above, the aggregated value was estimated at around 33.2 Million € per year ( Table 4 ). If we exclude the value of erosion regulation, the annual aggregate value of the park is set around 11.3 Million €. Negative values indicate carbon emission rather than carbon sequestration. 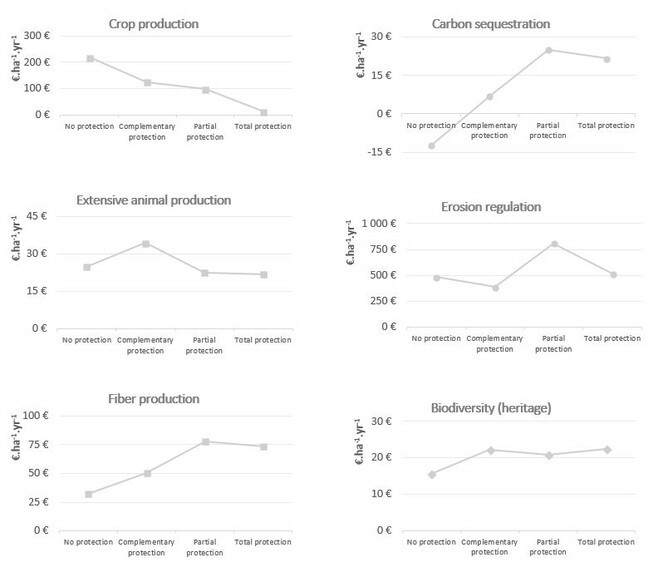 Aggregated park economic value (€.year-1) and breakdown per ecosystem typology. Aggregated economic value of the PNSSM. To gain further insight into the spatial value heterogeneity, we present a breakdown of the results per ecosystem services and per land-use typology in the park, following the national LULC cartography (COS 2007 level 2). Based on our findings ( Table 4 ), forests and shrubland are the ecosystems contributing most to the park’s annual economic value. Given the greater expression of forests and shrubland ecosystems within PNSSM in terms of area ( Table 4 ), we performed a per hectare analysis to compare the value of services delivered by different ecosystems ( Fig. 13 ). 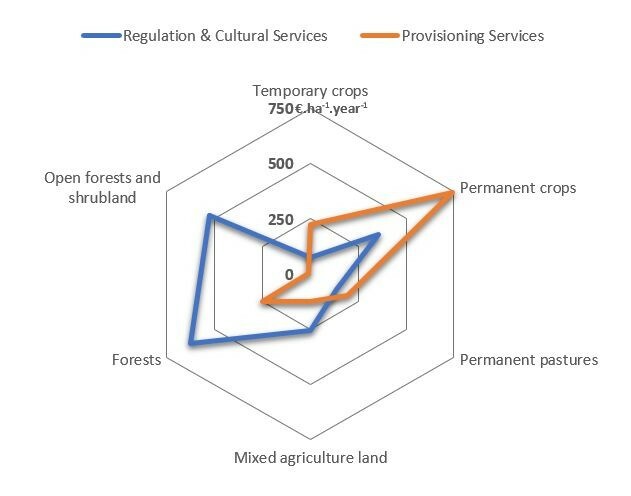 Results show that permanent crops deliver higher value of provisioning services (750 €.ha-1.year-1), whereas forests and shrubland ecosystem deliver higher value of regulating and cultural services (over 500 €.ha-1.year-1). Aggregate ecosystem service value (€.ha-1.year-1) per ecosystem typology within PNSSM. In order to compare the estimated economic value of each ES with its value as perceived by stakeholders ( Fig. 14 ), we have considered the percentage of economic value for each service, given aggregated economic value of ES (right column) and the percentage of points attributed to each service, given the total amount of points attributed to the six ES that were valued (left column). Results indicate that provisioning services combined received around 55% of the points attributed by stakeholders, being thus perceived as highly valuable, but their estimated economic value accrues to less than 30% of the aggregated park value. Additionally, Erosion Regulation seems to be undervalued by local stakeholders, as it received the least amount of points (5%) but its estimated economic value accounts for over 60% of the park’s aggregated value. This result should be critically interpreted given that the apparent imbalance between perceived and estimated economic value for erosion regulation should be framed in the context of how less visible regulating services are perceived but also regarding the potential bias introduced by the data used for estimating the economic value of erosion regulation. Indeed, as highlighted below, when erosion regulation is removed from the analysis (bar to the right in Fig. 14 ), we see a much less marked difference between perceived and estimated economic value. We further elaborate on this result in the discussion section. 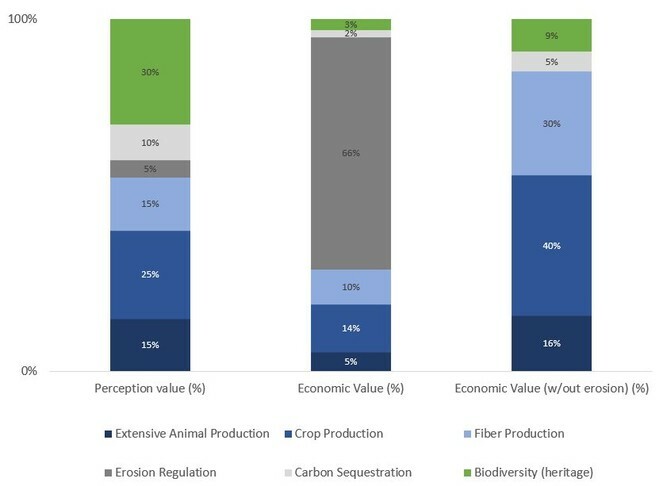 Perceived value by stakeholders vs. economic value estimated for the six ecosystem services delivered by PNSSM (provisioning services in blue, regulating services in grey, cultural services in green). 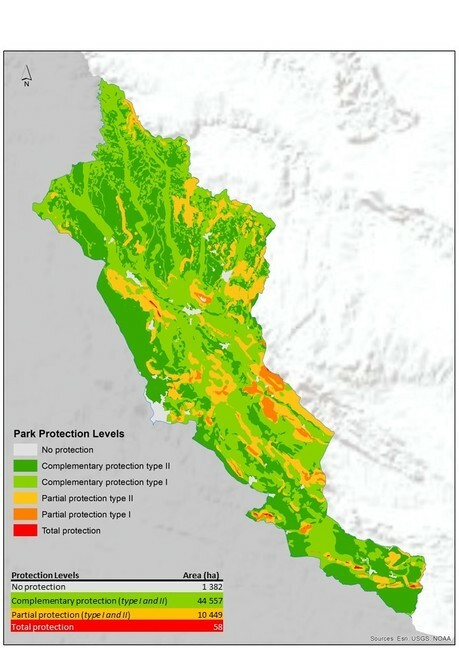 Since the economic valuation performed in this study had a spatial component, we could estimate the average economic value of each ES within park areas that have different protection levels ( Fig. 15 ). Results indicate that service value does vary with protection level. On average and excluding Crop and Livestock Production, all ES have an increase in value when going from areas with no protection restriction to areas with protection restrictions. However, most ES have maximised average values at a partial protection level. Biodiversity is the only service with slightly higher average economic value in park areas of total protection. Average economic value of each ecosystem service (ES) inside the different levels of protection established in PNSSM. Squared markers = provisioning ES; round markers = regulating ES; diamond markers= cultural ES. Given the overall context of this study (ES economic valuation and mapping as proposed by the EU 2020 Biodiversity Strategy in the context of PA management), our discussion centres around how our findings are positioned to bring the analytical framework adopted into the practice of PA management. As stated by dos Santos et al. 2015 , effective engagement and participation of targeted actors (stakeholders) play a crucial role in determining the success of conservation policies. The way stakeholder’s involvement is promoted may also determine the success, namely when it is seen as a legal obligation (in the form of opening a public consultation period) and is not based on conviction in its effectiveness or legitimacy ( Niedziałkowski et al. 2018 ). In Portugal, active public participation is still low and is often seen as a major cause for conflicts between managers and local stakeholders and therefore a major threat to achieve the desired conservation targets ( Marta-Costa et al. 2016 ). Our results indicate that active participation of local stakeholders is well and enthusiastically accepted by local stakeholders. This was evidenced not only by the high response and participation rate but based on the dynamics observed during the workshop. Participants in the local stakeholder’s workshop were aware of the benefits delivered by the park, were able to identify them but also accept that, given the different interests represented, a sort of consensus is needed to capture and to integrate ES and their value in PNSSM’s management plans. Our approach and results also bring into discussion the choice of valuation approaches (monetary vs non-monetary) and the distinct ES value perception that local and non-local stakeholders can have. For instance, the service with highest estimated economic value in our study was the least valued by local stakeholders in terms of points attributed (erosion regulation). Discussing this outcome cannot be detached from the importance of soil conservation and erosion avoidance in Mediterranean regions ( García-Ruiz et al. 2013, Guerra et al. 2016 ), neither from growing evidence that for regulation services,and namely when evaluated at local scales, stakeholders are likely to easily recognise services to which they directly rely or rely most ( Small et al. 2017 ). Moreover, our case study also raises the question of estimation accuracy and how to account for spatial variability. For instance, our erosion regulation estimation highlights limitations that could be attributed to our data sources. On the one hand, we mapped erosion regulation based on potential erosion using the USLE model ( Table 1 ). Though this method has been largely applied at different scales (e.g. Guerra et al. 2014, Panagos et al. 2015, Gaitán-Cremaschi et al. 2017 ), we highlight that no field validation of our estimation has been performed. Additionally, our methodology specifically considers a worst-case scenario for estimating erosion regulation, which may not be realistic. On the other hand, a constant unit value was used for estimating the economic value of erosion regulation and, in this regard, the potential spatial variability of the economic value was not accounted for. Furthermore, the study by Marta-Pedroso et al. 2007 , which we used as the study site in performing a value transfer, was based on several assumptions that might not be applicable to our case study area, including the threat that soil erosion represents, to ensure long-term farming sustainability. In fact, the results obtained by Marta-Pedroso et al. 2007 were based on an estimation of the costs that farmers would incur to maintain soil fertility (nutrients and organic matter, artificial reposition and downstream removal and in-situ stabilisation of eroded soil) and assuming such interventions were technically feasible and would restrict soil fertility loss. Despite the validity of the estimation obtained by these authors, it is not a case of revealed-preferences estimate (as no-one has incurred the cost). In this regard, our findings also highlight that carrying out an uncertainty and sensitivity analysis of economic valuation estimations is of the utmost importance ( Boithias et al. 2016, Schmidt et al. 2016 ) and crucial for ensuring rigour and transparency in communicating the valuation outcomes. Moreover, as pointed out by several authors ( Pandeya et al. 2016, Costanza et al. 2017 ), it is important to adopt mixes of monetary and non-monetary processes and not rely just on one approach or measure of value while ensuring that relevant stakeholders (at different scales) are involved. At this point, we should notice that a parallel analysis could not be performed for water quality and availability (also regulation services valued by local stakeholders) since, due to data constraints, the economic value of these services was not estimated. Data scarcity for analysis at local scales has been already discussed as an important challenge for the biophysical mapping and economic valuation of ES ( Pandeya et al. 2016 ). Hence and as stated before, our study was focused on testing how and why economic valuation and mapping of ES can be brought into the context of local protected areas management embedded in a larger analytical framework for ES assessment. Finally and in line with the findings by others in similar contexts ( Paletto et al. 2015 ), our results highlight the need to link biophysical spatial heterogeneity with economic valuation as fundamental to informed planning and zoning of PA but also to support management actions, investment guidance or PES (Payments for Ecosystem Services). We have shown that, for most services, individual ecosystem service value increases with increasing restriction inside the park ( Fig. 15 ). The main exception, crop production, follows the opposite trend, with its value clearly decreasing with increasing park protection. This indicates cropland management in restricted park areas is not particularly targeting crop yields but the maintenance of other ecosystem services. As expected, the aggregate value of ecosystem services delivered by PNSSM varies across the different ecosystems present in the park. Forests and shrubland are the ecosystems contributing most to the park’s aggregate value ( Table 4 ), together delivering over 60% of the park’s total annual value. This differentiation of forest ecosystems is also valid regarding the value of cultural and regulating services on a per hectare basis. The role of forests as multifunctional ecosystems, often associated with high economic value, has been widely acknowledged in literature (see e.g. Marta-Pedroso et al. 2014a ). Permanent crops are the ecosystem delivering highest value of provisioning services in the park (mainly due to the high commercial value of C. sativa and other nuts). Thus, our findings recall the importance of maintaining the landscape mosaic since different ecosystems provide different services and together contribute to social well-being. Despite the constraints of our estimations exposed throughout the paper, our findings create evidence to support funding for the establishment and management of protected areas and investments in green infrastructure as suggested by others (e.g. Green et al. 2016, Mell et al. 2016 ), as the aggregate value of the park (around 11 to 33M€) corresponds to roughly 0.1-0.3% of the regional GDP for Alentejo NUTSII, which is significant given the representation of the park in the region in terms of area (1.78%). The demand for timely monetary estimates of the economic value of ecosystem services (ES) is increasing in many countries and will also increase in Europe following the expected future integration of ES in appraisal of policies and projects that impact the environment. In this study we tested a three-stage approach to map the economic value of the ES delivered by a protected area (PA), namely the Natural Park of Serra de S Mamede (PNSSM). A main conclusion from our approach is that involvement of stakeholders in ES valuation is of utmost importance and should result in a balanced involvement going beyond local stakeholders. Some have argued that the watershed scale is a suitable one for ES assessment including economic value estimation and wesupport such reasoning. Spatially-explicit assessments provide specific advantages for several policy applications including, amongst others, nature conservation planning, targeting land restoration activities and designing payments for ecosystem services (PES). In our case, the findings of economic value mapping were crossed with the protection level zoning and we concluded that the annual flow of economic value of ES increases with the level of protection, with the exception of the crop provision service. In a different perspective, we showed that, despite specific methodological caveats that can be possibly attributed to our approach, the aggregate annual value figure of PNSSM is significant (representing 0.1-0.3% of the region’s GDP) and hence should guide not only both planning and management, but also the design of long-term effective conservation mechanisms, including PES schemes. The latter potential application is of particular relevance, namely when PAs are privately owned and PES are foreseen as a mechanism to be taken as a part of a nature conservation policy mix. This work has been carried out under the financial support of the National Authority for Biodiversity and Forest Conservation (ICNF) under contract AD 288/2014/ICNF/SEDE. Lia Laporta work is supported by the Portuguese Foundation for Science and Technology (FCT) through the PhD grant SFRH/BD/94195/2013. We would like to thank other members of the MARETEC team, namely Ricardo Vieira, Vânia Proença and Nuno Sarmento, for their significant contributions to the design and logistics of the participative workshop. We would also like to thank all workshop participants who very much enriched this work with their local knowledge on the ecosystem services delivered by the park. Can landscape‐scale approaches to conservation management resolve biodiversity–ecosystem service trade‐offs? J. Bouma & P. Van Beukering (Eds.). Ecosystem Services: From Concept to Practice (pp. 108-131). Análise de Rentabilidade das Áreas Submetidas a Regime Florestal. Programa de Desenvolvimento Rural do Continente 2007-2013. Versão de Março de 2010.
in: Azevedo J, Perera AH & Pinto MA (eds) "Forest Landscapes and Global Change - Challenges for Research and Management"
The Economics of Ecosystems and Biodiversity: Ecological and Economic Foundations. Earthscan Publications Ltd, London and Washington DC.